Also available in our walk-in store. 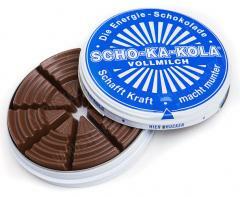 This stuff in identically-shaped tins has kept the Germans awake since the 30's. 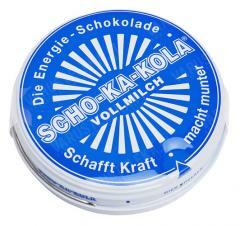 Scho-Ka-Kola is chocolate with lots of caffeine, essentially a mild combat drug! The wholemilk version isn't a wartime product, but a modern, sweeter alternative to the classic. Note: the cardboard box may or may not be included. It all depends on the position of the stars and the moon and what else. During WW2, Scho-Ka-Kola was a part of the aviator iron ration, and was widely issued alongside normal food distribution to the army. One can find mentions in contemporary soldiers' diaries of how they would despair at being issued Scho-Ka-Kola, since it invariably meant impending trouble. Bittersweet chocolate (cocoa 23,3 % min. ), with coffee and cola-nut powder. Ingredients: cocoa mass, sugar, cocoa butter, coffee (2,6 %), whole milk powder, cola-nut powder (1,6 %), emulsifiers sunflower lecithin + E 476, flavour. May contain traces of hazelnuts, almonds and gluten. 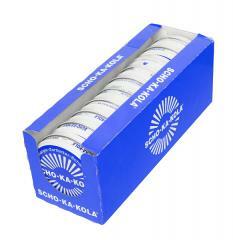 4 pieces of Scho-Ka-Kola contain about as much caffeine as a strong espresso. Use with discretion. Really. Similar product. Temporarily out of stock. Tastes great, gives loadsa energy. Great chocolate, and better price than you can find from other sources (that ship to U.S.) I would and have recommended this to many friends, who really enjoyed the samples I gave them. Ordered about a week and a half ago, with a 10 pack of the dark chocolate, and it just got here. It is everything I hoped it to be. It tastes like black coffee and milk, with a shot of mocha, condensed into a piece of chocolate. In pie-like pieces it keeps you from eating too much all at once and getting a caffeine buzz and a headache. Perfect for marches and hikes when you need calories and energy. This is awesome, they sent me one as a gift and I am ordering ten more! Good plot, they Putin'd me! I bought 2 tins a year ago. It has a nice toasted coffee and high end chocolate taste. I ate 2 pieces and was wired for a couple hours. Do not give this to your kids unless you plan on answering every question ever thought of not to mention they wont sleep for a very very long time. I made those 2 tins last almost 6 months. The chocolate is the best I've ever tasted. The tins are great for carrying things in your pack. Fire kit, sewing kit, small 1st aid, let your imagination go wild. Better yet, eat 3 pcs and you will have way more ideas of how to use the tin. I love the taste but it can be dangerous. Be very careful with this stuff. If you love chocolate like I do you'll find yourself eating more than recommended (which is probably something like one or two little triangles a day) It gives you a LOT of energy and you will notice yourself getting hyper and your eye twitching if you eat too much. It is definitely a good energy boost, which I wasn't expecting. My only other issue is that in the USA southeast, it WILL melt, and fast. It's basically only usable from mid October to maybe March if you intend to use it outdoors or in a vehicle. Just keep that in mind, it's really cool for what it is and the tins are excellent. I still use tins I got over a year ago and they keep a good seal for bits and bobs like fire starting kits, sewing kits, medicine, etc. Very tasty. Each tin contains 16 triangular pieces of chocolate. I try to limit myself to a few pieces a day but its tough. Sometimes I dip the chocolate in peanut butter. I don't plan on sharing. Not sure what I will use the tins for when the chocolate is all gone. Scho ka kola is great but I ordered a 10 pc package and upon delivery it only included 4 without box in a tattered parcel with my other order items. Thankfully, varusteleka are finns and not swedes, so they made it right.